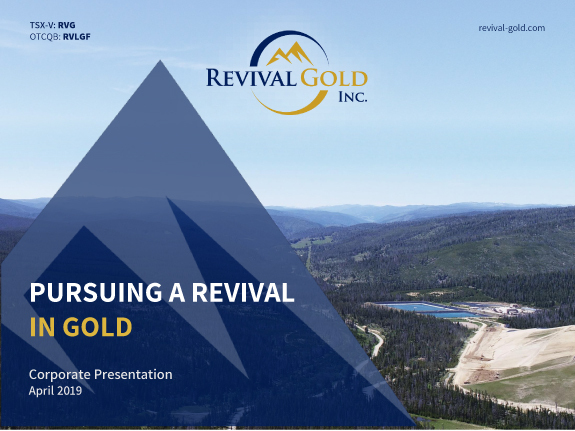 Revival Gold Announces AGM Results and Option Grant - Revival Gold Inc.
Toronto, ON – November 14th, 2018 – Revival Gold Inc. (TSXV: RVG, OTCQB: RVLGF) (“Revival Gold” or the “Company”), a growth-focused gold exploration and development company, anno>unces voting results for the election of directors at its Annual General Meeting (“AGM”) of Shareholders held on November 14th, 2018, in Toronto. Following the AGM, Revival Gold re-appointed Diane Garrett as Chairman of the Board, Michael Mansfield and Audit Committee Chair, Carmelo Marrelli as Compensation Committee Chair and Donald Birak as Technical, Safety, Environment and Social Responsibility Committee Chair. Subject to regulatory approval, Revival Gold has granted 1,350,000 incentive stock options to directors, officers and consultants of the Company. Pursuant to the Company’s Stock Option Plan, the options are exercisable at a price of $0.75 per share for a period of five years.